It’s not really lost. Gone is more like it. There is a difference. Being one of those nuances of the English language we wallow with on occasion the issue must be wallowed, else I can’t move on. Consider this a divertissement to the rest of the post. So if I lose a ring fighting a 3 lb. trout while flyfishing the Yellowstone River, it’s lost from me, but not gone. The trout got away too. Bad day. I’d consider the fish to be gone but not lost. If I’d landed him and made streamside ceviche, then he’d be gone. Say I lose my way. Definitely not gone. If it were gone I’d never find it again. I’ve tested that one. What about lost at sea? Possibly lostand gone. And all for the point Oklahoma once had a sea but now it’s gone. But not lost. And yes I think and write like this stone cold sober. Sundown. Salt Plains National Wildlife Refuge. A day hot enough to create mirages on the searing highway provides a vivid imagination the creative force to visualize the sea that once flooded the Great Plains. 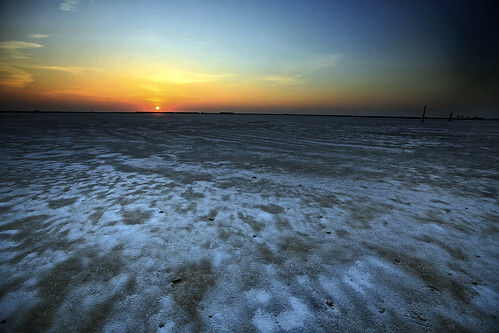 The tangible remains of the sea are now an expanse of salt flats. The only place in the world where chocolate brown selenite crystals with hourglass sand inclusions are found. Beats me why the state of Oklahoma hasn’t pounded home that travel destination highlight. Lots of scenarios could result in a disposable/single use film camera landing in your hands. The good news is great photos (even artistic photos) can be achieved with the simple equipment.